Chester: Shenton, Moran, Howson, Livesey, Grand, Stopforth, Roberts, Mooney (Jordan 78), Mahon (Pritchard 78), Murray (Dieseruvwe 63), Dudley. Subs not used: Dom Smalley, Deane Smalley. Ashton United: Pilling, Jackson, Hill, Ashworth, Baines, Chalmers, Sheridan, Kay (Martin 68), Chadwick, Tomsett (Sangha 46), McHale (Holgate 46). Subs not used: Lees, Regan. Kick off was delayed by fifteen minutes because of traffic hold ups on the M56. Not only were the visitors delayed travelling from Manchester but also many of Chester’s management and players too. When the game got underway though it was City who were quick off the mark. Once again Mahon wove his magic on the left and drew three defenders towards him like a magnet before slipping the ball across to Dudley who opened the scoring after two minutes. Chester’s early lead was short-lived on Saturday but this evening they continued to dominate without making too many clear cut opportunities. They did, however double their advantage when Howson bundled the ball home after Livesey headed a corner towards goal. Ashton had offered very little in terms of attacking play in the first half but they altered formation in the second, switching to three at the back, throwing centre back Ashworth up front and introduced a couple of substitutes (Sangha and Holdgate). They began to mount more of a threat to City’s goal and the home fans grew restless. On the hour mark the match took a decisive turn when Mahon chased a seemingly lost cause and won a corner on the right. Mooney swung the ball in, Livesey’s header found Dudley with his back to goal and City’s number nine controlled it and then spun to whip the ball into the back of the net. Blues began to dominate once more as Dieseruvwe came off the bench to pep the attack up once again. Soon Mooney provided the perfect cross for the diminutive Mahon to head home a fourth goal. The game was now beyond United but they continued to plug away until the bitter end. In stoppage time their persistence was rewarded when Jackson’s shot looped off Shenton’s dive and on to the bar before spinning in to the net. It sent the travelling fans home with something to cheer about at least. Chester moved into the play off places with this win and are now nine unbeaten in the league. The Blues have a couple of games in hand on most of their rivals and are well placed as they contemplate a tough away trip to Brackley, just one place above them, at the weekend. Chester: Shenton, Dominic Smalley (Pritchard 65), Grand, Roberts, Moran, Howson, Mooney, Stopforth, Dudley (Thomson 90), Deane Smalley (Dieseruvwe 65). Subs not used: Murray, Jordan. Alfreton Town: Ramsbottom, Clifton, Wilde, Hird, Gowling, Shiels, Bateson, Hotte, Styche (Hobson 81), Peniket, Johnson (Clackstone 25). Subs not used: Sinnott, Nicholson, Platt. Chester came into this fixture – the first in the League for almost a month – boosted by the loan signing of Mani Dieseruvwe on a month’s loan from Salford. This was to cushion the blow of losing Matty Hughes, who had been on fine form until his injury against Hereford. Alfreton Town also recruited during the week. Reece Styche had joined from Darlington. Sam Hird and David Lynch had also signed. Hird and Styche started for the visitors but Dieseruvwe began on the bench for City. On a sunny afternoon the game began brightly for the Blues when Clifton impeded Mahon’s run in the box and Roberts swept home the resultant penalty after just four minutes. It did not take long for a riposte from the Reds though, as Shenton’s goal kick was headed firmly back where it came from by Shiels and Styche took advantage of a flat footed City defence to slot the ball past the advancing Shenton for the equaliser. Worse was to follow when Dom Smalley conceded a foul on the edge of the box and Johnson’s free kick curled round the wall and past a static Shenton into the net. Alfreton were reduced to ten men shortly after this when Clifton was dismissed for flying in to a tackle with Garry Stopforth. The Chester player hobbled off after treatment but returned to the fray only to be felled again by Hotte. Although this appeared an even worse tackle the perpetrator only received a yellow card this time. Blues continued to be held after the break and Alfreton continued to harry and press and even threaten to extend their lead. But with the introduction of Dieseruvwe and Pritchard for the Smalley brothers Chester gained new momentum. The Salford player showed impressive movement and good control and began to get City’s forward play ticking. He cut in from the left and pulled the ball back for Stopforth who found Roberts who in turn fed Mooney on the right. The latter’s shot was blocked on the edge of the box but as the ball bounced Roberts pounced to lash it into the top corner for a sensational equaliser. The goal prompted a purple patch for Chester who began to dominate completely. Dieseruvwe clipped his shot from Dudley’s pass wide when it seemed easier to score. Then Moran advanced and fired an excellent drive which crashed against the bar and away to safety. Mooney shot venomously just past the far post. Then he was set through on goal and body-checked by Wilde who was lucky just to receive a yellow for his troubles. At the other end Alfreton introduced Chester old boy Hobson to respectful applause from the home crowd. In inimitable style Hobbo soon began to make a nuisance of himself –even more so when Howson became entangled in his flailing arms and legs and emerged to see referee Speedie brandishing an extremely harsh red card. Shenton did well to tip Bateson’s free kick on to the cross bar. The game was once again in the balance. Deep into stoppage time, Josh Gowling lunged from behind at Dieseruvwe in the penalty area. As the tall striker fell to the ground, referee Speedie pointed to the spot. Roberts addressed the penalty kick for the second time in the game but this time went for the other side of the goal. Keeper Ramsbottom anticipated and saved the shot but could not hold on to the ball and City’s captain gleefully tapped home the rebound to complete an unlikely hat trick and send the home supporters into ecstatic celebrations. Tempers ran high on the pitch after such a hard fought game and climactic result but its entertainment value could not be questioned. Dunston UTS: Dryden, Marrs, Halliday, Stafford, Grant-Soulsby, Capewell, Thear, Pearson, Fitzpatrick, Brooks (Heslop 59), J.Elliott (Nellis 64). Subs not used: C.Elliott, Harrison, Little. Chester: Shenton, Grand, Howson, Thomson (Dudley 82), Livesey, Stopforth, Burton (Pritchard 56), Roberts, Deane Smalley, Mahon (Hellawell 86), Mooney. Subs not used: King, Murray, Noble. 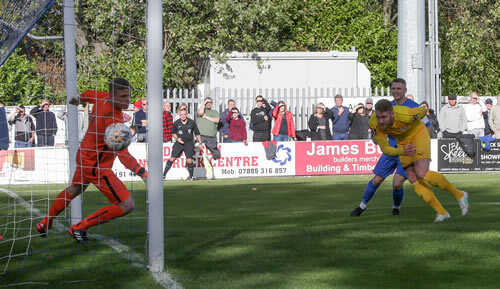 Chester had Danny Livesey sent off as they were dumped put of the FA Cup in a seven goal thriller at Northern League Division One side Dunston UTS. The Blues got off to the worst possible start as striker striker Liam Brooks put Dunston ahead inside the opening two minutes with a low shot into the corner following a one-two on the edge of the box. The home side continued to pile on the pressure with Chester’s back four struggling to cope in the early periods of play. Chester slowly began to carve out some chances of their own, Livesey headed over and Dan Mooney shot just wide from distance before the equaliser came ten minutes before the break. Craig Mahon sent in a cross that was met perfectly by Dean Smalley who steered his header past Karl Dryden in the home goal. 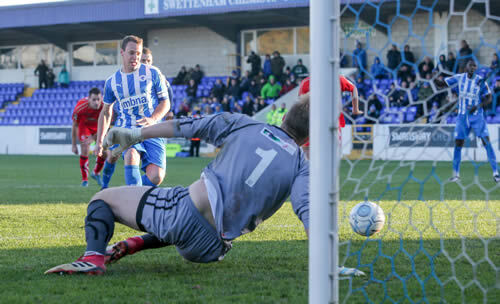 Mahon sent Mooney through with a fine ball on the stroke of half-time and the on-loan player couldn’t have struck the ball better finding the top corner of the net to give Chester an interval lead. Dunston came out for the second period on the front foot and were soon level. 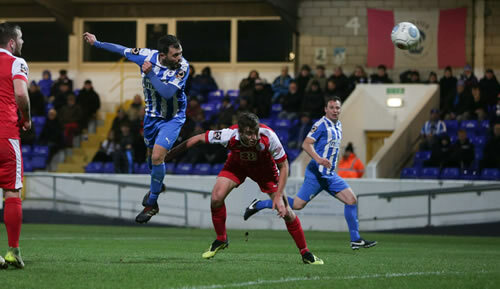 Scott Burton brought down Jack Elliott to concede a penalty that was converted by Mark Fitzpatrick, and four minutes later Livesey was red carded for a foul on Fitzpatrick as Chester were reduced to ten men. Andrew Grant-Soulsby then headed the home side ahead from a corner, but Mooney was on hand to restore parity with a fine low shot into the corner for 3-3. With Chester players appealing for a foul on Matt Thompson, Fitzpatrick raced through the Blues back line to fire the winning goal past Shenton. There was still time for Dryden to make a great save to deny Mooney a late equaliser as the minnows held out for a famous victory and a home draw against local side Gateshead. Chester: Shenton, Moran, Grand, Howson, Livesey, Burton, Mooney (Jordan 80), Stopforth, Murray (Pritchard 59), Mahon, Hughes (Deane Smalley 45). Subs not used: Thomson, Noble. Hereford: Horsell, Thomas, Greenslade (Lam 80), Richards, Smith, Culliane-Liburd, Bird (Green 80), McGrath, Jackson, White (Dinsley 70), Hall. Subs not used: Harrison, Sainty. Chester moved fifth and extended their unbeaten run to eight matches with this deserved home victory over Hereford. The Blues started well and on ten minutes they had their first sight of goal as Dan Mooney’s 20-yarder flew inches wide of Martin Horsell’s post. Marlon Jackson saw an effort fly over the bar for the Blues before Chester opened the scoring on 15 minutes. Craig Mahon won a tackle and set Gary Stopforth free and his cross was cut back for Matty Hughes to score via a deflection. Iwan Murray saw a free kick drift wide as Chester looked to build on their lead. Grant Shenton, who had had little to do in the home goal, had to move smartly to deny ex-Blue Harry White who sent in a dipping shot that was pushed away for a corner. There were huge appeals for a penalty following a foul on Hughes in the box by Harvey Smith, referee Sam Mulhall waived play-on and the injured Hughes had to be replaced by substitute Deane Smalley. Mahon saw an effort fly inches over the bar as Chester started the second half on the front foot. Bulls midfielder Mike McGrath was booked for diving in the penalty area and picked up a second yellow card minutes later for a late foul on Mahon to reduce the visitors to ten men. John Pritchard doubled Chester’s lead on 72 minutes shooting into the far corner following Jon Moran’s pass. The Blues continued to press and sealed victory three minutes from time as Smalley headed home Stopforth’s cross.